Start with: Two rays with a common endpoint. Construct: A ray dividing the angle between the rays in two equally large angles, such a ray is called an angle bisector; dividing into two equal parts is called bisecting. Start with: A line and a point on the line. Construct: A line through the point perpendicular to the given line, a so called normal line. Start with: A line and a point not lying on the line. Construct: A line through the point perpendicular to the given line. Start with: A line and a point. Start with: A line and a point not on the line. Start with: A circle c and a point P.
Construct: A new circle having the same radius as the circle c and having the centre P.
Start with: Two rays a and b with a common endpoint P, and a ray c having another endpoint Q.
Construct: A ray d with the endpoint Q such that the angle between c and d is equal to the angle between a and b. Hint: Start the construction as below. 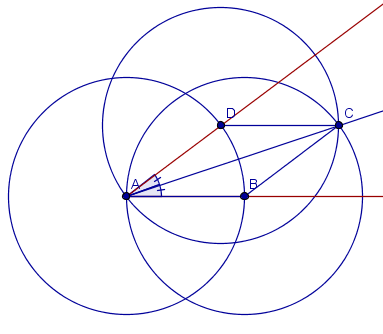 Finish the construction to trisect the segment. Explain why the construction works! Comment: The task of trisecting an angle would have been just a tad more difficult. Use the three congruence theorems, the theorem about isosceles triangles and the theorems about angles to prove that the constructions 1-7 are correct. Hint: Place triangles in appropriate ways into the constructions. You must show that the angles BAC and CAD are equal. Mark the triangles ΔABC and ΔACD. Use one of the congruence theorems to show that the triangles are congruent. Justify that you can use this theorem. 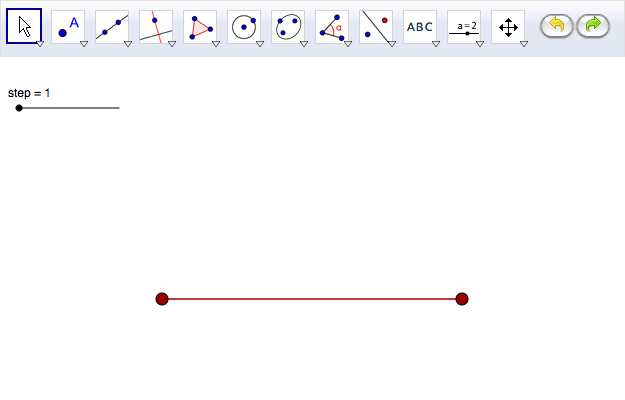 Show that the angles BAC and CAD are equal. 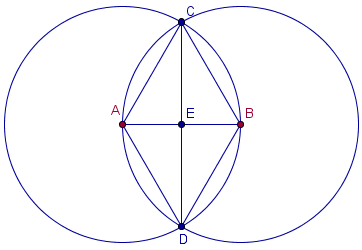 You must show that the segments AE and EB are equal. Show this for the angles: DAB=DBA=CAB=CBA. Then show this for the angles: BDC=ADC=ACD=BCD .